Traditional Mexican chilli bean filling, suitable for tostados, tortillas, tacos etc. This is the recipe made for the original BLUE KITCHEN Hot Chilli Sauce. If using canned kidney beans, drain and rinse under warm water. Squeeze and crush about 70% of the beans, leaving some intact. If using the dried variety, soak overnight, then bring to boil, let simmer for 20 mins, before draining and lightly mashing. Heat oil in a medium heavy based saucepan. Add onion, and when beginning to get soft, add mush-rooms, bacon and garlic. Fry gently till soft. Add crushed/mashed beans, tomato paste & chilli sauce – mix well. Turn down heat and stir in tomatoes, zucchini, basil, pepper & salt. Cover, and let simmer for 20-30 minutes, stirring regularly. If the mixture looks like it’s getting dry, add moisture – a slurp of beer, red wine or water will do. 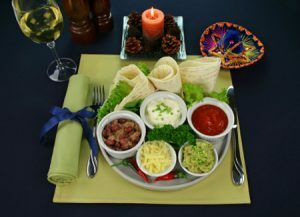 If serving tostados, cook the tortillas one at a time in sufficient heated oil to cover – about 30 seconds each side, or until crisp and golden. Drain on paper towels. To assemble the tostados, spread the tortilla with frijoles refritos. Stack with sliced avacado, sliced tomato, shredded lettuce, sour cream and top with grated cheese. Some also like slivers of bar-b-qued/fried chicken breast added as well. 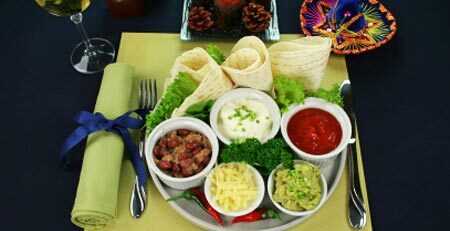 For tacos, arrange shells on a platter and fill with finely chopped tomato, shredded lettuce and grated cheese. Sour cream optional.